We went to Atlanta a day early so we could meet some pals before things got busy. I went to Stitch's house for a couple of hours. We had a wonderful visit! He is lots of fun! He even throws his own ball to play fetch! BOL!! The next morning we checked into the Westin because BarkWorld was starting! This year BarkWorld started with a Howl-O-Ween costume pawty! Before the pawty, several attendees had the privilege of attending a speed dating session with many of the sponsor brands. I was one of the lucky attendees! I enjoyed meeting several wonderful people. Then it was time to dress for the Pawty! 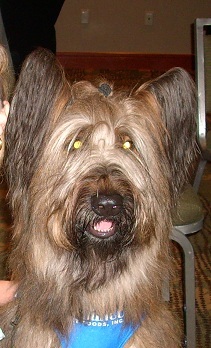 We were photographed by Geoff Bain from Wagdazzle. Can you guess what Mom and I are dressed as? BOL!! Bats! Not batty girls, bat girls! BOL! Geoff photographed me with my roommate Emmy. I was very happy to share a room with Emmy again! I even came out of my duffle bag when she arrived. 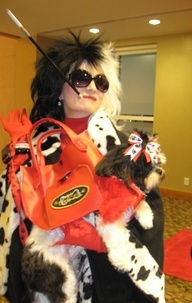 My favorite costume was Kona dressed as a handbag with her mom dressed as Cruella Deville. 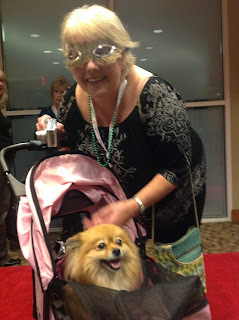 My pal Jasmine has several photos from the pawty on her blog. My mom was so happy to see her friends that she forgot to take lots of photos. Apparently I need to refresh her memory about her job description! BOL!! I was a tired little bat pup by the end of the pawty. Emmy caught me napping on the job during a session on Friday. Mom was busy taking notes for me, so I'd forgive her lapse with the photos. 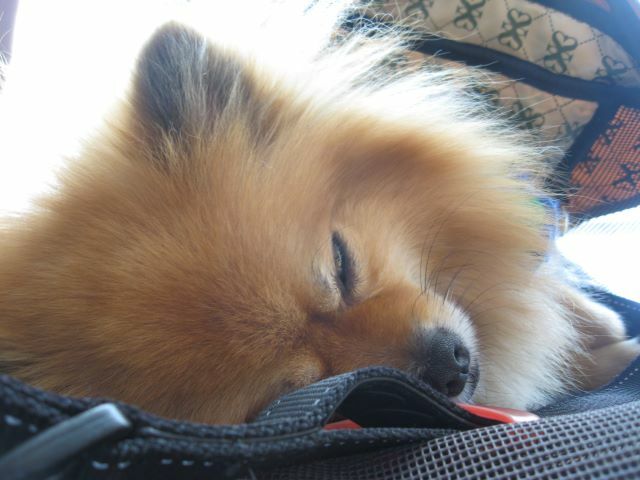 Emmy caught me napping again! I guess I was still tired from the pawty. BOL! 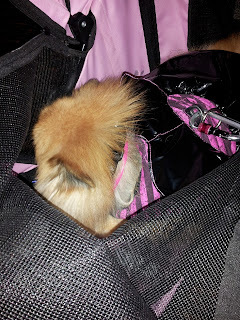 I had fun barking at all the dogs between sessions when Mom would push my stroller around the exhibit area. Between sessions all the humans were playing BINGO! They had to get a star from each exhibit by the end of the day to enter a raffle. 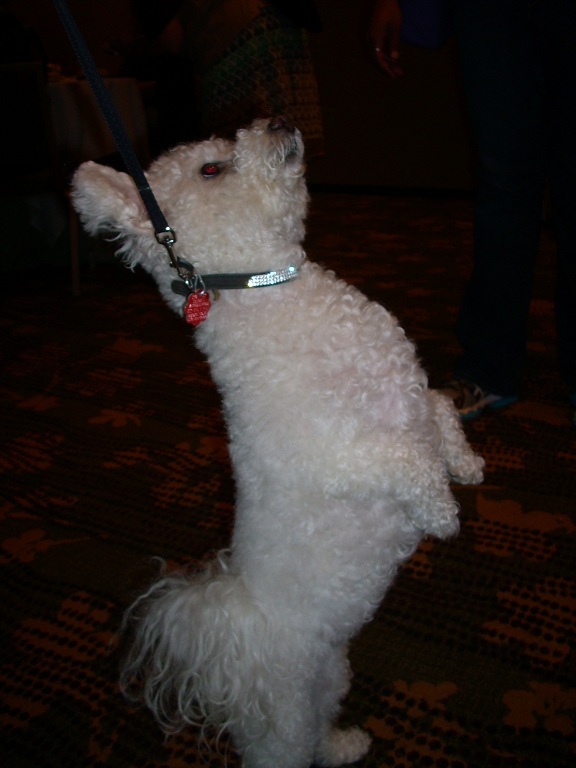 After Mom put her card in the raffle drum, we went to dinner with SnoopDoggDoxie from NipClub. Then it was time to Pawty again! 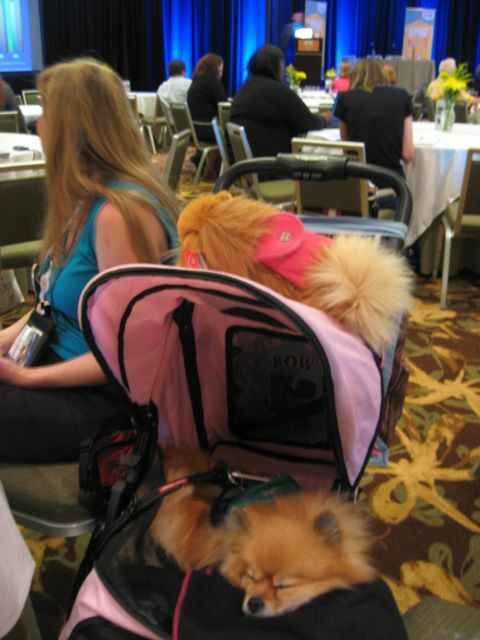 Mom was able to get a photo of the talented celebrity Norman the Scooter Dog. We also saw Niqqi, she is so adorable! I even had my caricature drawn at the pawty! After the pawty I went up to our room with Emmy, while Mom went pawty some more. BOL!! She was celebrating a pal's birthday. (I won't say who because humans like to keep their birthdays private after they are adults.) Humans are funny! BOL! I know I didn't woof about the entire trip in this post. Don't worry, I'll bark about the rest of BarkWorld in another post. Hi Petie! I was very busy, but had lots of fun! It would have been pawsome to meet you! Maybe you can go next year. WOW! I love the drawing of you Pepper! Thank you Pookah! Now Mom needs to frame it. BOL! Hi RA! It would pawsome if you could go one year! I'd like to meet you in furson! 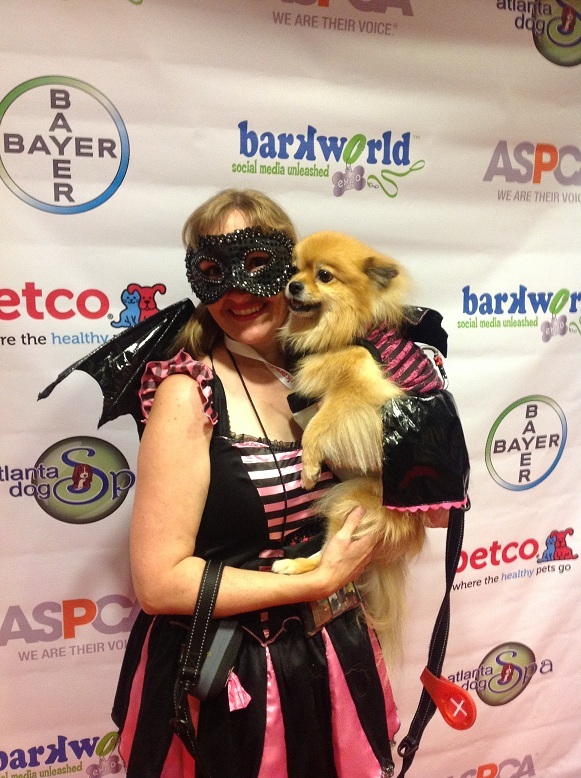 PepperPom looks like you& PepperMom were hafing lots of fun at BARKWORLD. I lubs yewr "carrotcature." It captures yewr "floofiness" beary well. Looking forward to reading more about he conference. Thank you Chazz! It does look like me - floofy! BOL! I just popped over from Blogpaws to meet you! Hey!! 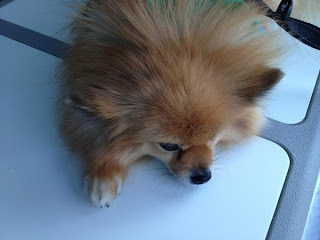 My sister is a Pom, but she is grouchy towards me.... Anyhoos, just wanted to say hi! WOW Pepper what a great time you had and thanks for sharinf all the kewl photos! Thank you! I am happy to share photos! What a lot of fun!!! No wonder you needed so many naps, BOL!! BOL!! True! Most of the photos are of me napping. If I wasn't barking, I was snoozing! BOL! Thank you AJ! I had lots of fun! For a Pom, being puffy is a good thing. BOL!! Love the photo...so cute!! So glad you had such a great time. Can't wait to hear more about it. Thank you Lyvonne! It was pawsome to see so many pals in furson! Wish I could have met you too! I think it's totally unfair that I didn't get to go. So what if I wouldda puked in the car or wouldda drove everybody crazy? woo woo woo! OMD! Rumpy, puking isn't fun. I take it that travel doesn't agree with your tummy. Awwww, at least your mom brings back some goodies for you. OMC! What a time you and your momma had, so cute as bat girls! And you was one tired bat pup, and oh so cute when you is sleeping Pep! Hi Baby Patches! Thank you! What fun we had. I absolutely love your caricature! That is so cool. Great seeing you again. It was a pawsome time! Great to see you again too! We have to do it again! You guys were so cute! !